Have I told you about my great love for Taco Bell? No, seriously, this isn’t a joke. And the meat? What is that stuff? Does cheese really look like elastic and glow? Over time, my budget increased and taste-buds matured. My beloved Taco Bell just didn’t cut it anymore. I moved on to “finer-quality” taco restaurants. Then, real food hit. The glory of real beans–soaked, cooked in a bit of salt, and served steamy hot. The taste of grass-fed meat, so rich and satisfying. The realization of real raw sour cream. And cheese. Oh, heavens. Topped off with fresh veggies. Suddenly, not a single taco joint in town could satisfy the cravings of a real homemade taco or fajita. Tacos, fajitas, anything in a flour tortilla and topped with an array of colorful choices continues to be my most desired dinner. The desire takes over weekly. 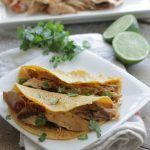 As much as a homemade taco dinner sounds easy, and trust me, it is, I often long for a simpler, easier homemade taco or fajita. The chopping of the veggie assortment, the sauteing the peppers, and perfectly seasoned and cooked meat is often more than a tired mama can handle. Enter my friend the crockpot. 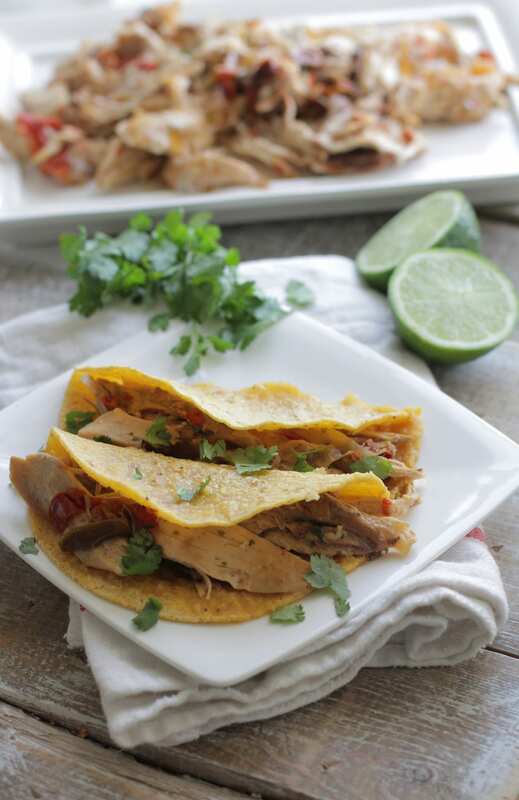 These fajitas are made in the crockpot, with a whole pastured chicken. Perfectly seasoned with a mixture of dried herbs and a hint of soy sauce and squeeze of a lime. Only five minutes of prep and a few hours later a delicious and fresh fajita dinner is waiting to be served. This meal is also budget-friendly. By using a whole chicken, our family is able to enjoy leftovers for days. Taco salad, nachos, and taquitos are served regularly following fajita night. Don’t forget to save the bones to make a delicious, nourishing homemade chicken broth. This meal is also budget-friendly. 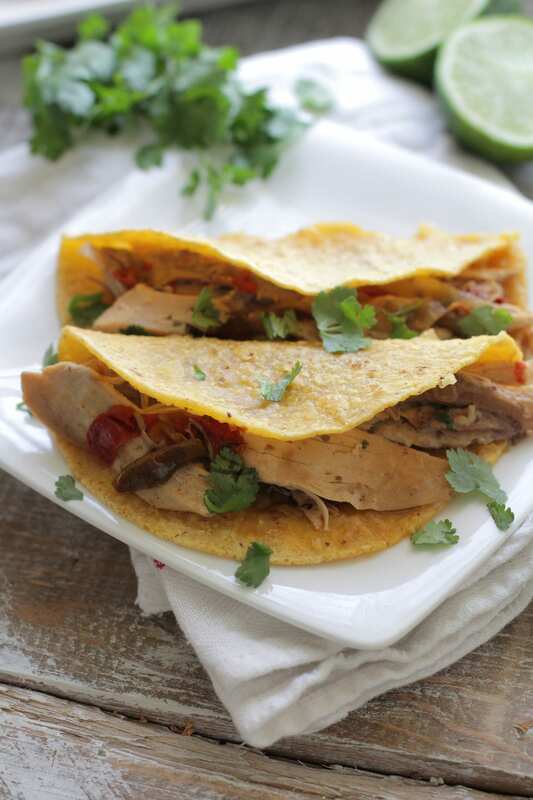 By using a whole chicken, our family is able to enjoy leftovers for days. Taco salad, nachos, and taquitos are served regularly following fajita night. In a small bowl, mix together: chili powder, cumin, oregano, and salt. Rub the spice mixture on the chicken. Add the chicken to the crockpot (I use this one). Top the chicken with sliced peppers, onion, and minced garlic. Pour the soy sauce and squeeze the lime juice over the top. Cook the chicken in the crockpot for 5-6 hours on low. When done, the chicken will easily fall off the bone. For the Corn and Cilantro Saute: In a skillet (I use my cast iron skillet), melt 1 TB butter. Add the onion and saute' until translucent (3-4 minutes). Add in the corn and cilantro. Saute' for 5-7 minutes. Squeeze a hint of lime juice over the top. Serve on top of chicken fajitas. These look delicious! It doesn’t look like there’s any added liquid (besides the soy sauce) so does the chicken stick to the bottom of the crockpot at all? Also, do you make your tortillas? I can’t find any decent ones at the store but really don’t have the time to always make my own. 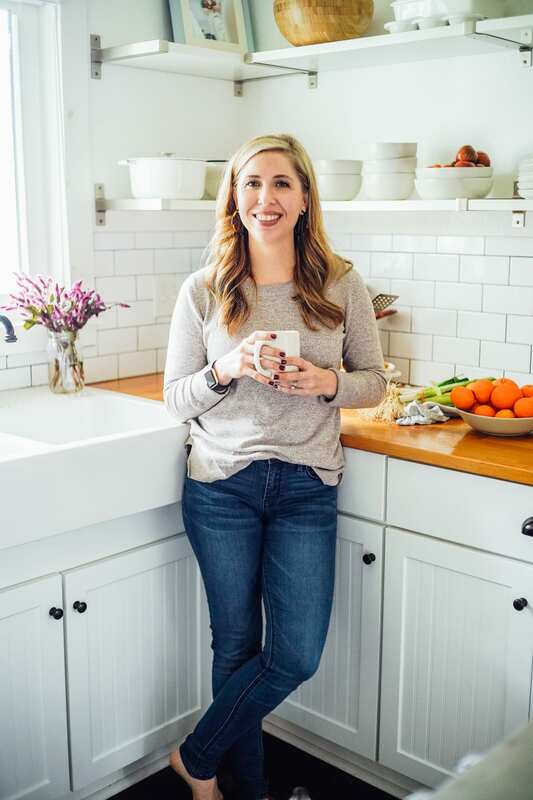 Hi Laura, As the chicken cooks, the juices naturally collect at the bottom of the crockpot which prevents it from sticking. Just like when you roast a chicken. Oh my word, yum! I can’t wait to try this. We always buy whole, broiler chickens, so now I can finally make a unique meal with them. I’m always buying whole chickens and always looking for a new way to use them. 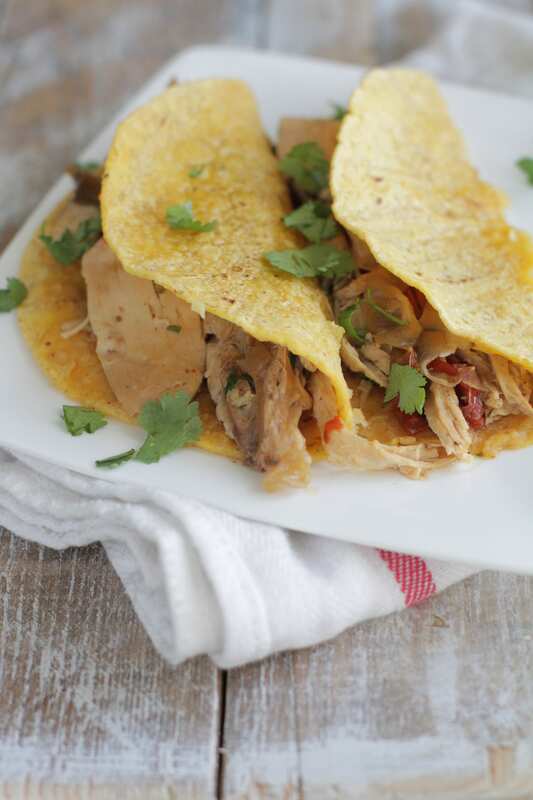 This chicken is super yummy and always leaves a ton of leftovers. Enjoy :). Oh this looks so delicious. I want to try this but I dont have a crockpot :((( I have a pressure cooker. Do you think I could make it in the pressure cooker? 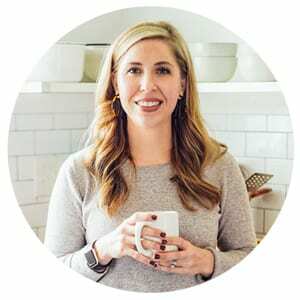 Hi Sara, I don’t have a pressure cooker, so I’m not sure how this recipe would turn out. If you try it, let me know. Hi Alison, I use a local brand of tortillas. We aren’t gluten-free, so they do contain wheat. I also like Food for Life’s Corn Tortillas. They are generally found in the freezer section of a health food store. oh looks yummy….I am also a sucker for anything taco-burrito related 😉 We do the “burrito bowl” thing around here often! I have a whole chicken in the crockpot right now and was planning on “something” with chicken for dinner but I hadn’t decided what yet and found this….perfect! Since I didn’t get the spices in there before I cooked it, I think I will get the meat off and throw it in a pan real quick with some onions and peppers and saute it around for a few minutes with the spices! Yum! That sounds perfect, Jen!! Enjoy dinner. Have you ever tried putting a few fresh black beans in the bottom? I wonder if it would produce enough stock to cook them? Might need to add a little stock. Hey Cheryl, I haven’t tried adding black beans to the bottom of the crock-pot, but I bet they would be delicious in this recipe. I would definitely add a bit of liquid (chicken broth or water) so the beans don’t dry out (and burn) in the beginning. a bite. Will not make this again? Hey Pamela, I’m sorry to hear that your experience wasn’t so great. Yes, a whole chicken takes time to debone and pick from a crock-pot. I’m surprised to hear the chicken was dry…was there extra liquid at the bottom of the crock-pot? Just made this and the Guac. for dinner. Amazing!! Whole family loved it! (2, 5, 10) always great when the kiddos ask for more! Hey Belinda, It’s great to hear you loved the chicken and gauc :). Thank you for sharing! Hey Diane, I haven’t done this in the IP yet. 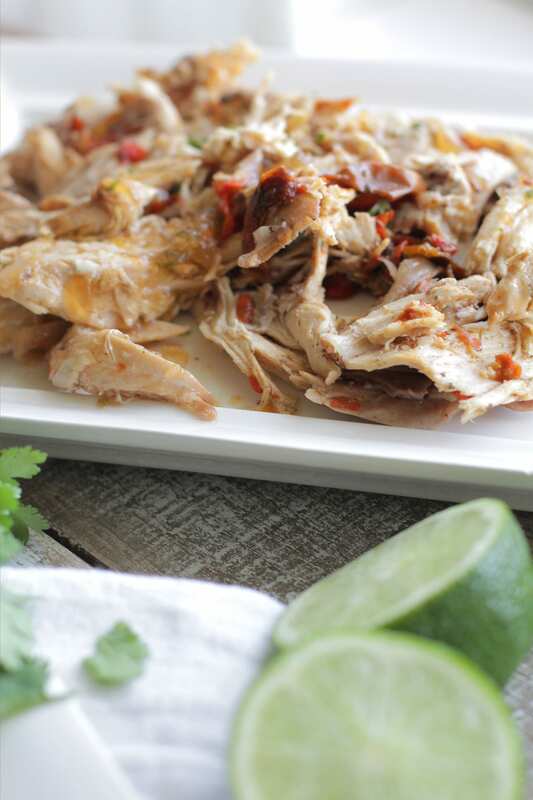 I wonder if you could use this recipe: https://livesimply.me/2017/03/14/instant-pot-whole-chicken/ and just add peppers and such.